A remarkable watercolor by James J. Tissot, "It is finished! Consummatum est!" 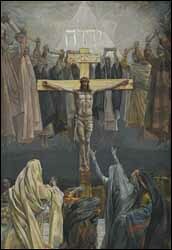 (1886-1894) showing the crucified but triumphant Christ, behind him the holy name of Yahweh in Hebrew letters, and surrounded by the prophets holding up their scrolls of prophecy which he has fulfilled. (Brooklyn Museum, NYC). Larger image. Jesus' journey had begun in a simple stable in the City of David thirty some years before. Now it was finished. What Did Jesus Come to Accomplish? Jesus had a very clear view of what lay ahead of him. He used two metaphors: "To drink the cup," to partake fully of an event, and "to be baptized," to be immersed fully in the event. The cross in all its horror -- and in its redemptive power to bear the sins of the world -- hung heavily on Jesus during his last days in the flesh. His struggle in the Garden of Gethsemane was the climax, the point at which he surrendered ultimately to the Father's will. And now the cup had been drunk, the baptism completed. It is finished. Look again at the passage. It is remarkable in how it repeats one singular idea -- completion, fulfillment, finishing. "Completed / finished / accomplished" in verses 28 and 30 is the related verb teleō, "to complete an activity or process, bring to an end, finish, complete something." With regard to time, it means, "come to an end, be over. "54 Moreover the tense of this verb is important to us -- perfect tense (tetelestai). In Greek the perfect tense signifies a past action, the effect of which continues into the present. It has been completed and is still complete. The effect of the tense in this verb is a sense of finality. In the last couple of centuries scholars have found thousands of papyrus scraps with Greek writing on them. Many of these are mundane commercial documents in which we find this word. Moulton and Milligan pored over many of these receipts and contracts to better understand New Testament Greek. They observed that receipts are often introduced by the phrase tetelestai, usually written in an abbreviated manner indicating that the bill had been paid in full.55 The obligation has been completed. The debt has been paid off. Tetelestai -- it is finished. It is clear from Matthew and Mark that just before Jesus breathed his last, he "cried out again in a loud voice" (Matthew 27:50, cf. Mark 15:37). John gives us the content of this loud cry: "It is finished!" Those who are defeated go out with a whimper, but the victor announces his victory loudly and broadly: "It is finished!" The victory shout of Jesus echoed across the small flat hilltop and to the world beyond. It is finished! he humbled himself and became obedient to death -- even death on a cross! Make no mistake. The ability to say, "It is finished" to the Father's commission was not the beginning of some kind of "glory road," but the end. It was the final culmination of a life of obedience, humility, and suffering that now ushers in a new era. What Should We Learn from "It Is Finished"? When we meditate on this Sixth Word from the cross, what should we learn for our lives? This is what I see. First, we are to live lives of purpose. Unless Jesus had a purpose, a mission to complete, the words, "It is finished" would have had little meaning. He wasn't speaking of his earthly life that was finished -- in fact, his life has no beginning and has no end. Rather, he is speaking of that which the Father had instructed him to do. Our lives may not be so clear, so purpose-driven as Jesus' life. However, I believe that one of the signs of maturity in our lives is to discern our spiritual gifts and abilities, and then order our lives so as to maximize what God has given. Jesus told the Parables of the Talents (Matthew 25:14-30) and the Pounds (Luke 19:11-27). In each case, success for the servant was to "trade with" what the master had given him in order to produce the largest possible outcome for the master, given each servant's unique talents, time, and circumstances. The reward was to hear the master say, "Well done, good and faithful servant ... enter into the joy of your master" (Matthew 25:21, RSV). Second, living lives of purpose requires us to focus on our priorities. Instead of living scatter-shot lives, we are to be marksmen that aim carefully at the target and make our shots count. This requires focus and discipline. It means saying "No" to some choices so that we can say "Yes" to opportunities that are even better. Obedience is the opposite of independent action. It means living in obedience to God, not to ourselves. Finally, to say "It is finished," we must be willing to suffer to achieve God's purpose for our lives. We continue in the sunny summer days as well as the stormy winters of our lives. We don't give up just because things are difficult. We are willing to suffer whatever is necessary to complete the Father's plan for our lives. And with Jesus to say: "It is finished!" Father, I've wasted much of the momentum of my life because I've tried to go in so many directions. Please corral me so that I will focus on your purposes and your direction for me, that I might finish this life well. In Jesus' name, I pray. Amen. Q6. (John 19:30) What had Jesus "finished"? What can we learn for our own lives from this Sixth Word: "It is finished"? What did Jesus come to accomplish? What was his "prime directive"? What was the "cup," the "baptism" that he faced in order to accomplish his mission? What was the significance of the word "Finished" written on ancient papyrus receipts? How is the willingness to suffer vital to finishing one's mission? 54. Teleō, BDAG 997, 1. 55. J.H. Moulton and G. Milligan, Vocabulary of the Greek Text: Illustrated edition the Papyri and Other Non-Literary Sources (Eerdmans, 1957), p. 630, under teleō.